Welcome to fall and cooler temperatures! Those of you who read Doug's notes on Leadership & Management here each month know that he vehemently believes taking time to clear our heads will make us more productive employees and people. Doug's a frequent advocate of turning off the TV, giving the Blackberry a break, and opening up a book or going for a walk. Only in clearing out the noise can we make room for inspiration and creativity. For us, this notion is a necessity, not a suggestion. So you can imagine how thrilled we at L&A were to notice a bit of a trend in the news media recently: A call for boredom. This concept of boredom is really another way of suggesting we clear up the media and information clutter, take some quiet time, and eliminate empty distractions to create space for new ideas. We believe strongly in the value of clear the mind time. It is much more intellectually and creatively restorative than decompressing in front of the TV, which is more liable to distract the mind from receiving inspiration. With summer over and work kicking back into high gear, now is the perfect time to remind ourselves to do nothing every so often in order to think more clearly. This month, we're replacing The Fed links with some links On Boredom & Big Ideas. We hope you find these articles interesting and inspiring. There's a certain tedium to opining each month on an economy stuck in the mud. Given that virtually every fiscal, monetary and regulatory stimulus effort has failed to put us on a sustainable growth path, Washington appears unable to understand our situation. And another possible recession is officially back on the table. What's wrong with this picture? The obvious answer is that Washington, Wall Street and their European counterparts don't really understand what's going on. Nor does anyone seem to know what to do about it, except kick the can further down the road yet again. The United States and Europe are called Developed Markets. But given our persistent economic lethargy, one has to wonder if the more accurate moniker might be Mature Markets or Mature Economies. Is the Western economic world an over-the-hill economy, with a potbelly and flabby triceps, hamstrings and glutes? Has our economic eyesight deteriorated? It certainly seems our joints are aching and our economic libido is not responding to stimulation. Is an economic cane and mobility scooter in our future? Looking back, we should now know that the economic miracle of the 1990s had virtually nothing to do with leadership in Washington, but everything to do with the rapid assimilation of productivity expanding innovation. Everyone needed to buy a fax machine, cell phone, PC and get an Internet connection. Each became a new need. None of us had them before. Purchasing these new needs didn't just create economic growth it also made way for productivity growth, as those items became part of our work tools. Needs that increase our productivity are obviously economically inspiring. Eventually, the proliferation of these new needs saturated our economy, resulting in a personal productivity plateau. Now we struggle with too much email, too much media, too much information and too many gadgets. Much of the new technology today - flat panel TVs, digital cameras, game players, social media - are things that support leisure more than productivity. Even the marvelous recent products from Apple are as much about leisure as they are about productivity. According to the Bureau of Labor Statistics, the number of people employed in the United States today is about the same as it was in 2000. The number of jobs in the U.S. has remained the same, while, according to the Census Bureau, our population in the same period has increased by more than 27 million. How does that math compute? We have over 27 million more people, but the same number of jobs as 11 years ago? Is it any wonder that the President just came out with a new jobs creation proposal? And what a surprise that presidential candidate Mitt Romney also just issued a jobs plan of his own, alleging to add 11.5 million jobs in his first four years in office. Seeing that our economy produced zero new jobs last month, Romney's plan, which projects 240,000 new jobs each and every month, suggests that the Wizard of Oz might be running his economic team. At L&A, we believe the easiest way to create more American jobs (and fast) is to unleash our natural resources. Economy - anywhere and everywhere - starts with natural resources. Nothing can be made without starting with natural resources. Nothing can be turned on without energy. If there are more natural resources to extract and exploit in this country, we should, and with putting-a-man-on-the-moon vigor. Unleashing our natural resource industries would not require any government borrowing or necessitate creating any new government agencies or programs. But it would create jobs, greatly improve GDP, and bolster tax receipts. Thanks to a more than welcome break in the temperature, I sat on a restaurant patio for lunch yesterday with a good friend and former investment banker, now CFO. As we enjoyed our al fresco lunch, on two occasions we saw people drive up in an expensive, foreign-made car, pull up to the curb, and park square in front of us. Both of the sleekly dressed drivers who emerged from their fancy cars were obviously there to pick up a to go order. Just 10 paces away sat a very visible, open parking space. Yet both of these people chose instead to put their exotic cars on display in a non-parking space that also happened to block the flow of traffic. After the second person left, my friend and I looked at each other in disbelief. He said, "I guess entitlement isn't just a problem with the people on food stamps." How many companies have we seen experience amazing economic success, only then to crash and burn? How many stories have we heard of tremendously successful people who somehow manage to fritter away entire fortunes? There is nothing like prosperity to numb the mind of self-discipline. If you happen to grow prosperous beyond expectations, take caution. It is hard not to let success and prosperity go to our head and dissolve our discipline and perspective. If only we could retain a sliver of modesty and maintain a healthy fear of failure, all that we have accomplished, earned and achieved just might stay with us far longer than the time it takes to park on a curb and run in for a sandwich. A recent article, "Modern Poverty Includes A.C. and an Xbox," got us wondering about how much (or little) Americans are saving these days. While it's obvious that today's poor having a big screen TV cannot be a harbinger of responsible personal savings trends, we were still stunned by the data. The chart below shows the percentage of income people have been putting away in savings from 1959 to today. 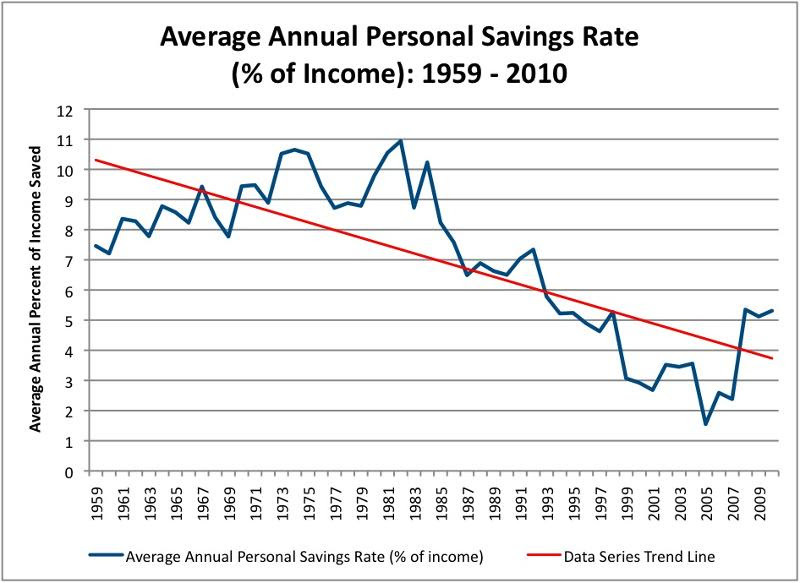 The trend line says it all: The personal savings rate is sloping downward at an alarming pace. Somewhere after the rush of prosperity began in the 1980s, we appear to have forgotten that how much we save needs to take into account the ever increasing cost of living and the time-value of money. With wages stagnating, a declining share of income going towards savings, and an insecure employment market, people will be woefully unprepared not just for retirement, but also for any jarring life events that require tapping into a nest egg. And with Medicare and Social Security set to contract benefits sooner rather than later, this is not a good confluence of events. In our overly committed, overly informed, and multi-tasking world, doing nothing is all but frowned upon. But neuroscience - and a host of notable and famous success sorties - tells us that's just plain wrong. In fact, data shows that allowing our minds to slow down could very well be a prerequisite to imaginative innovations and groundbreaking inspiration. To fight boredom is to fight creativity, according to Scott Adams, the successful creator of Dilbert. Adams explains that if not for a significant period of ennui, Dilbert would never have popped into his head. What other moments of genius and inspiration are we missing out on by pulling out our iPhones the millisecond we have nothing to do? Where have all the big ideas gone? We are living in truly uncharted economic waters. Big ideas might never have been more important. Why then does it seem that the really big game-changing ideas appear mostly in the rear view? Might we be missing inspiration every time we choose empty entertainment over quiet moments and boredom? Likening the global economic crisis to a once-harmonious marriage gone bad, PIMCO's Bill Gross explains that economic divorce would mean recessions across developed economies. Gross outlines three examples of demise in inter-country economic "marriages" that threaten a second recession: 1) The dysfunctional and imbalanced open marriage of the EU countries; 2) America's officially-rocky, increasingly spiteful marriage to the American Dream; and 3) The high stakes and potentially toxic love affair between Western consumers and Asian producers. Energy states, farm states, and Washington D.C. hold the top 10 spots for job creation in the first half of 2011. Could post-Gulf oil spill regulation be the reason Texas has dropped out of the top 10? Global finance industry woes put New York state, among others, in the bottom 10. If natural resources are the clear job creation winners, shouldn't that be driving our economic policy? Are the best leaders actually humble servants to those they lead? In this Washington Post leadership character series, the author, an Army field artillery officer, argues that the most inspiring and motivating leaders focus on how they can help their teams and employees, rather than asserting their strength and doling out demands. By definition, being a leader means being accountable to people who need things from us. Keeping this in mind wins respect, admiration and a sense of duty from those we lead. Are CEOs nothing more than actors? Well, obviously no. But this doesn't mean they can't take a page from Clint Eastwood's book. If the objective of any good leader is to engage and captivate, then taking cues from acting isn't a half bad idea. Among other rules of theater, this article urges leaders to apply story, character and emotion to your leadership strategies to create more compelling and inspiring messages. Steve Jobs is undeniably among the world's most game changing managers. A former Apple employee shares what he views as Jobs' management secret sauce. At core was Jobs' ability to maintain Apple's start-up culture, calling it a "giant start-up." Even through Apple's meteoric rise, the company resisted bureaucracy and instead emphasized employee respect by giving each employee the freedom to own and improve his work. Jobs successfully kept the focus on the company's core competence, rather than slowly turning it towards management and corporate structure. Read on for more of Jobs' management genius. Collaboration has become a bit of a fad word in the business world. However, why does it so often fail? Perhaps it is because too often it gets confused with teamwork. Strategically built teams (as opposed to often ill-fitting collaborators with competing agendas and goals) are the superior and preferable source of productively functioning groups. Follow the link to learn what defines a successfully built team.